I just got an Azumi AZ3 a couple months ago, and it was bent very badly today. 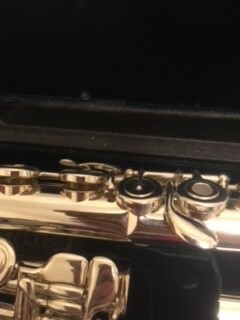 I put it on my bed to get out my music, but it was taking a while to find so I sat down, thinking that I had put my flute far away enough that it wouldn't be sat on. You can probably guess what happened. 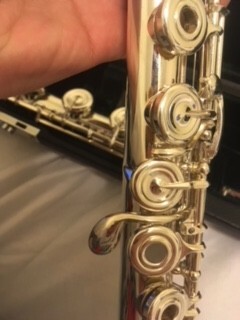 The key above the visibly bent part refuses to move unless I apply some pressure, and there's a very visible dent where the flute bent. How much do you think it'll cost to repair if it's even fixable? 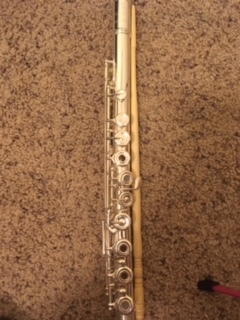 I luckily have a spare flute for band (I'm in high school right now), but I feel horrible about what happened because my parents haven't even finished paying it off yet. 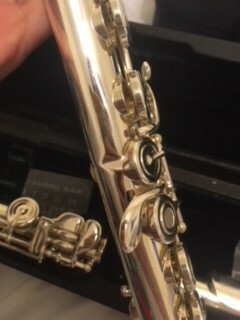 Your flute can definitely be repaired. 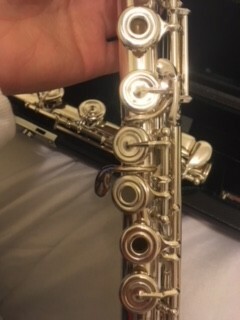 I've seen flutes bent far worse than that repaired. I can't really tell you how much it will cost because a flute tech will have to look at it in person to determine the extent of the damage. Repairs like that are basically charged by the amount of time it takes to straighten the bent body and any related damage. It looks like the worst part of the bend may be affecting the second G (G#) tone hole. That will likely require the most time to fix because the tone hole must be absolutely level or that key will leak. If I had to guess (based upon what I can see in your photos) it will probably take at least a couple of hours labor to repair and most shops will charge by the hour for that type of repair. It will also likely require some new pads around the damaged area.